Tired of the store-bought light snacks on board on a day-sail? Getting home hungry because the store-bought snacks are just wind, no solid sustenance? Not going for long sails because you get very hungry in spite of the snacks you took on board? Why not bake fresh bread on board? Your own product has much more sustenance than the commercial bread, perchance a lower GI. Here is a recipe for making those delicious Indian flat breads. Some call it naan, the Indian word for bread. 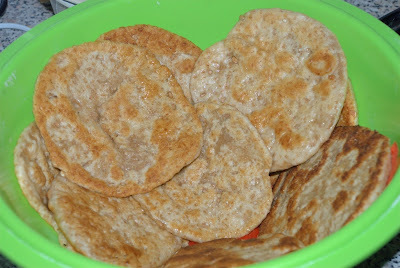 It is also known as puri and there are many recipes for this. You would traditionally have these as a side dish with spicy dishes. Sometimes as a wrapper. There is, however, nothing that stops you from enjoying these with any stewed dish. Just think of it: warm, freshly baked bread that you tear little pieces from to use as a wrap for the food, then for mopping up the last of the sauce in your plate. 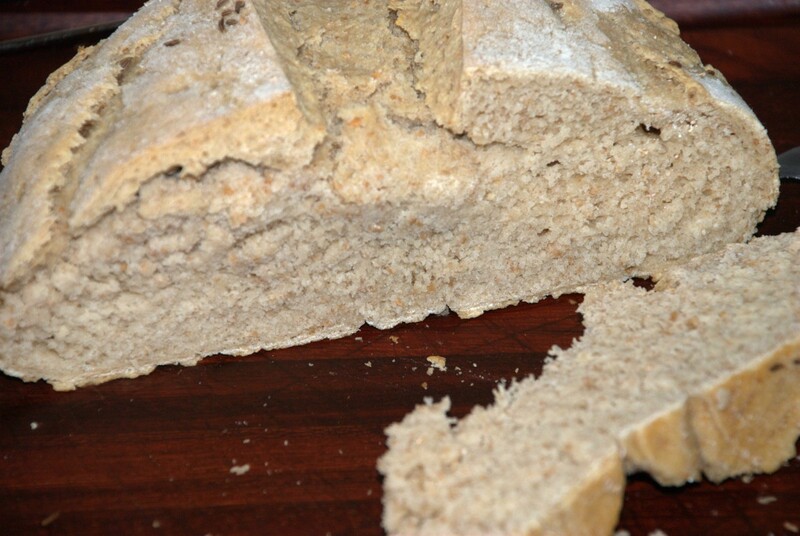 This one is a leavened bread, baked in a dry pan, therefore easy and quick to make on board. And it goes well with any stewed dish with a reasonably thick sauce. There are unleavened versions that are as easy to make, but we shall discuss those in another post. The preparation time is short and baking time is as for pancakes. Add to this some waiting time for the yeast to activate (more or less twenty minutes, zero if you use instant yeast) and for the dough to rise, some 1½ hours. The very short cut on this is to buy ready-mix dough from your local supermarket. Just the baking remains. A very good idea for short passages. It is advisable to use a large plastic salad bowl for mixing the dough, as things may get messy and your shipmates may complain about the mess. Less mess, less cleaning afterwards. You need a cutting board for chopping the garlic if you haven't got chopped garlic on hand. You will also use the board as a kneading board for rolling bout the dough balls. It is money well spent to invest in a proper cutting board, even if it is only slightly larger than an A4 sheet of paper. Get the largest one that is useful on your boat. 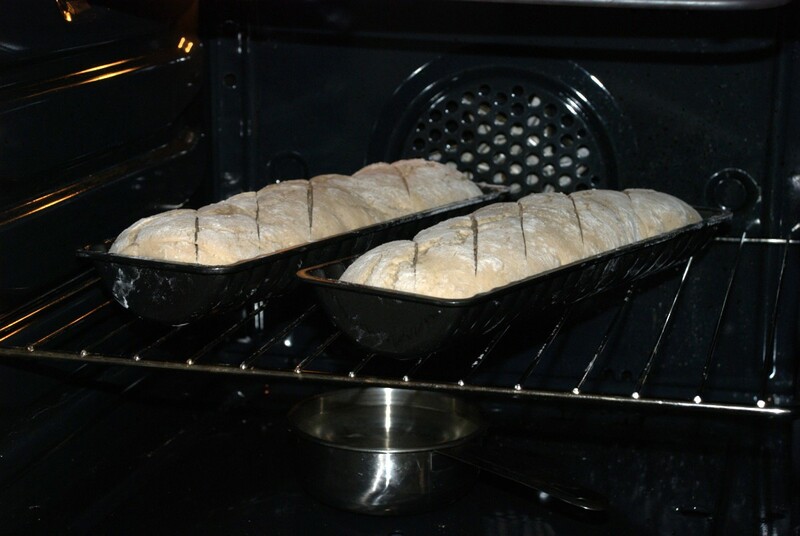 In the sequence of food preparation on board, this bread is baked while the main dish rests. 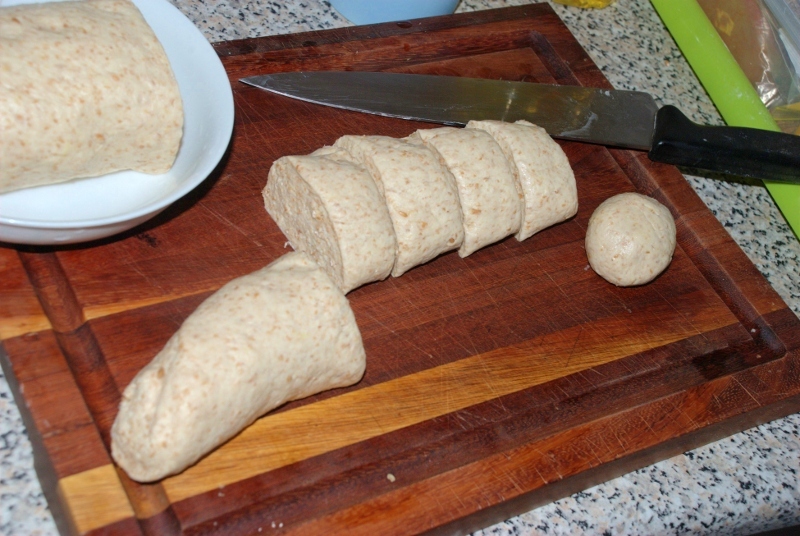 The dough is prepared prior to meal preparation. 1 teaspoon dry yeast or instant yeast. 2 teaspoons plain yoghurt, if available. 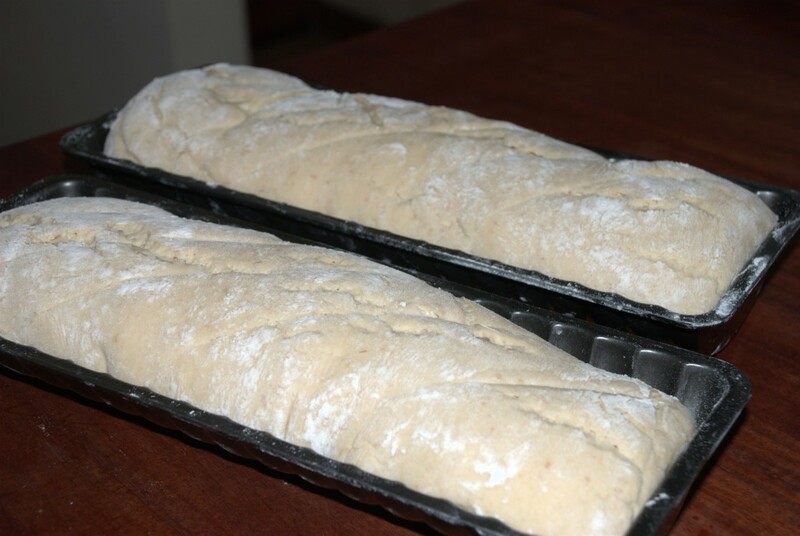 2 cups white bread flour. Cake flour will also work, but bread flour gives a better texture. ¼ cup molten butter or margarine. Ghee is the best, but perhaps not readily available on board. 3 cloves fresh garlic, or 3 teaspoons whole cumin seed. I prefer fresh garlic. Mix the dry yeast and sugar in the warm water. If you cannot hold your finger in the water, it is too hot. In the even of the water being too cold, you will be waiting a long time for the yeast to activate. It should bubble and foam after fifteen minutes. 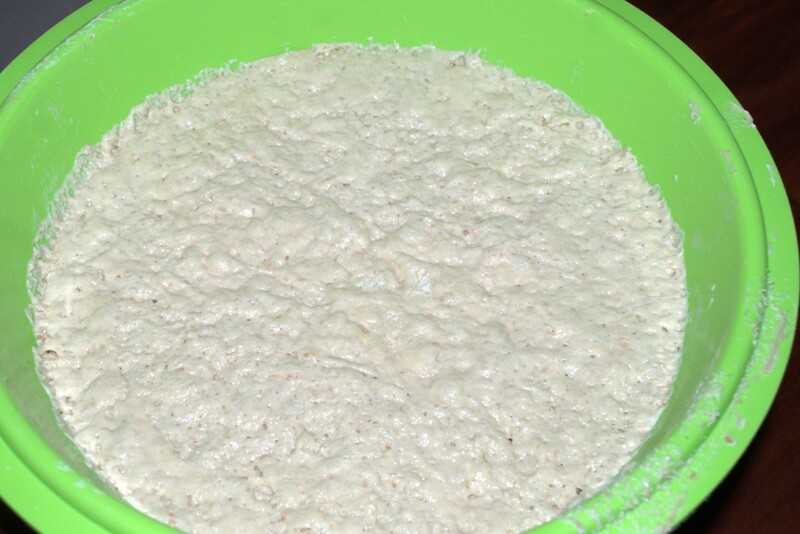 Skip this step for instant yeast, it works differently. Mix the flour and salt. I use a whisk to mix the dry ingredients. It is small and a useful implement on a boat and works better than a fork. Add half the butter and all the yoghurt. 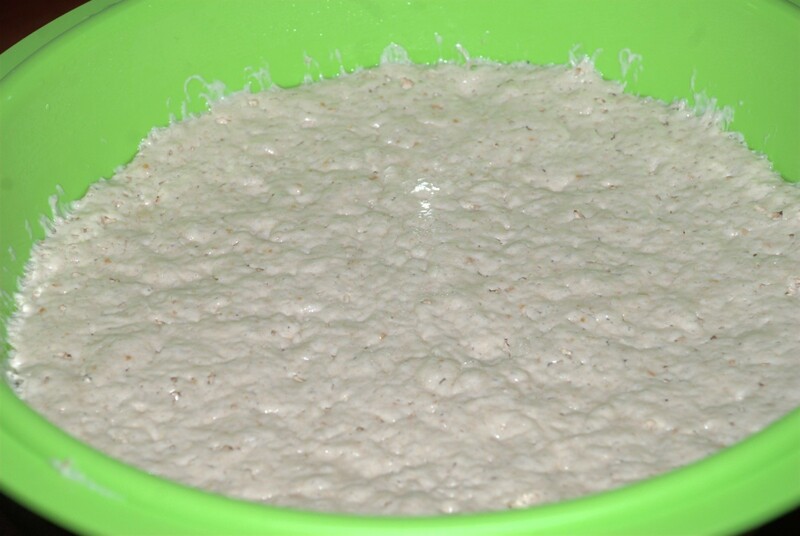 When the yeast is nicely foaming, add some a little at a time to your dry mixture. 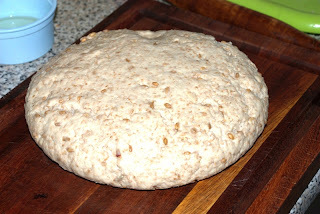 Keep adding yeast until you have a slightly runny bread dough. 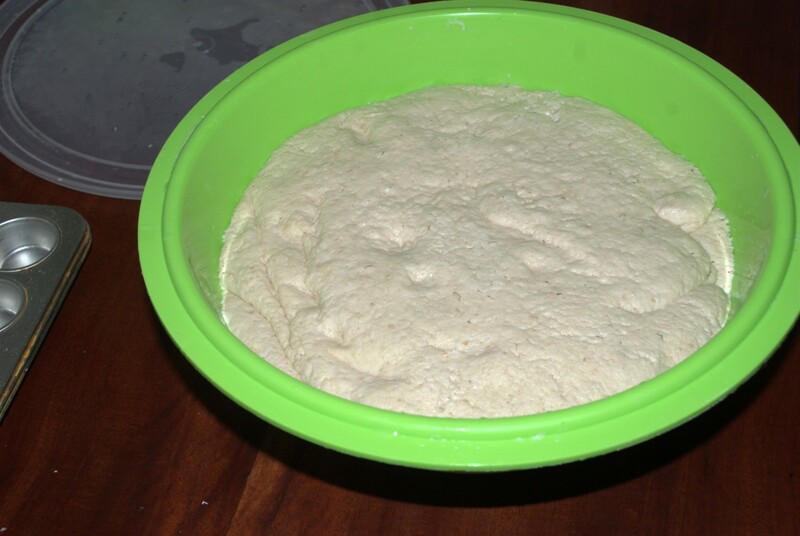 If you are using instant yeast, mix it in along with all the other dry ingredients, then add the warm water a little at a time to get the same consistency in the dough. 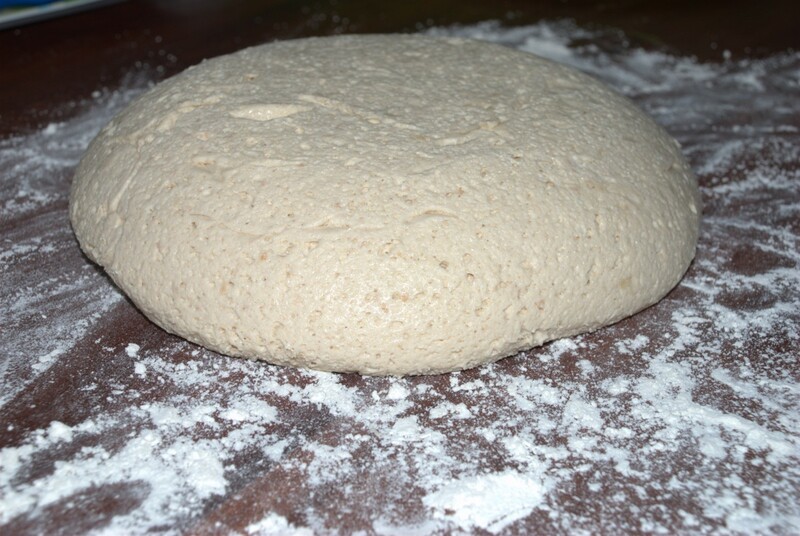 The dough needs to be reasonably elastic. Wet your hand and knead carefully until the dough gets a ssatiny texture and is nice and elastic. This takes ten odd minutes. Add a little flour if the dough stays runny. Don't mix self-raising flour and yeast, the two clash and you may end up with interesting results. Now leave the dough to rise. Smear a bowl with oil or butter to prevent sticking. I usually pat some oil on the outside of the dough ball to prevent the sticking and drying out. Otherwise just cover the dough with a wet cloth and keep it warm. 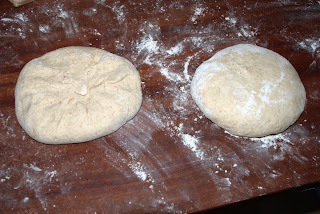 The dough must rise and double in volume before the next step, else you have very flat bread. Rise time should be about 90 minutes. After the dough has risen to the required volume it gets kneaded back to the original volume for about five minutes or so. Roll this into a cylinder of about 50mm thickness and divide this into six pieces. Roll each piece into a ball, then roll the ball in the crushed garlic or cumin. Then roll each ball out flat into a 100-120mm disk, about 4mm thick, perhaps a small pancake size. 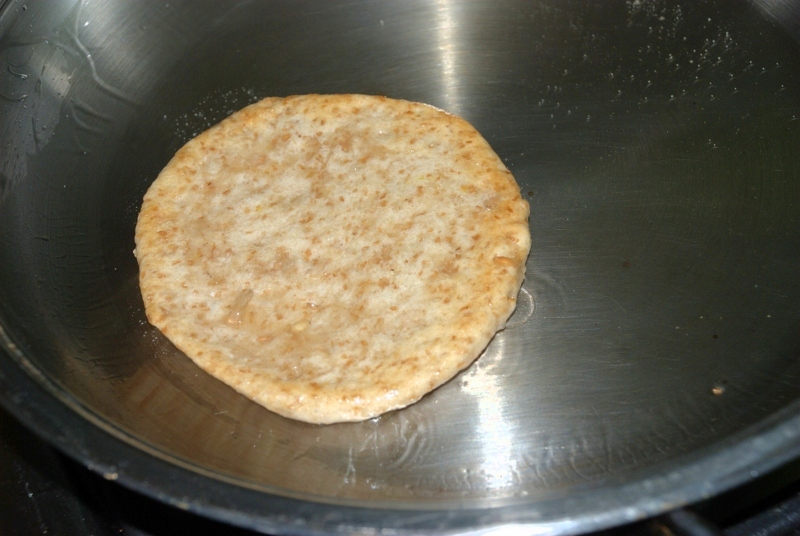 Smear butter or ghee on one side of the naan, then bake one at a time in a dry pan at medium heat. Butter the top before turning the naan over. You do one at a time, which gives you time to prepare the next one in line. In this way you use less space in the galley and you get maximum use of your time. 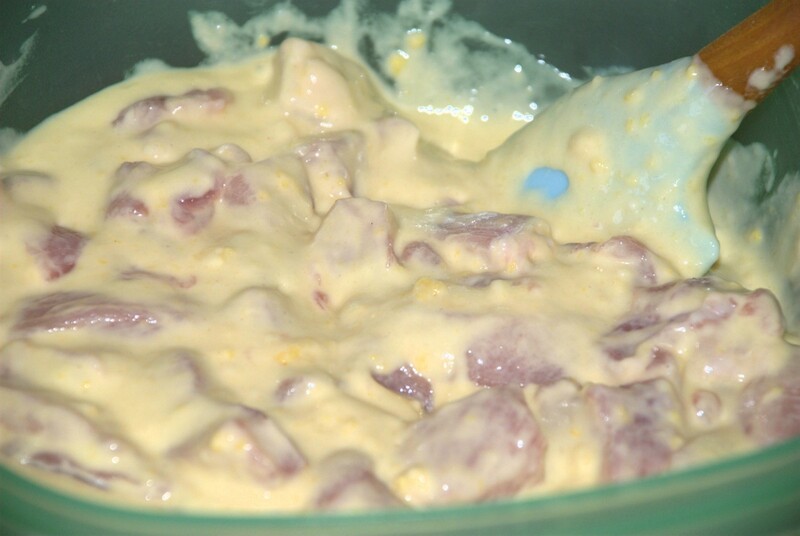 This is a rehash of recipes from Allrecipes.com, where there is a large number of similar recipes. My first foray into making baguette ended in a success. I was using instant yeast for those, as I was feeling out on a limb a bit. One of the vagaries of blogging is that one's ego tends to get in the way with the cooking and you wish for a resounding success every time. Well, the world simply does not work that way. However, it is a lot easier on the ego to just define your effort as an experiment. Then most of the results are a success because then you tend to learn a little with each experiment. Exactly my thinking this time around. I took a deep breath, opened the refrigerator and hauled out my trusty wild sourdough. Time for the next experiment. I had already proved to myself that I can bake a decent baguette, even though it comes out a bit heavier than the industrial ones. Now it was time for the sourdough version a la Ziets. This time around I allowed time for thawing of the sourdough to the extent of one hour. It is summer here in the Cape, with the temperature in our little town of Strand getting into the early thirties Celcius, which is quite hot. I did not bother to wash the yeast to get rid of the acid this time, but just fed both the containers with about a cup full of unbleached, stone ground white bread flour. This was left to multiply while I went about my normal chores. 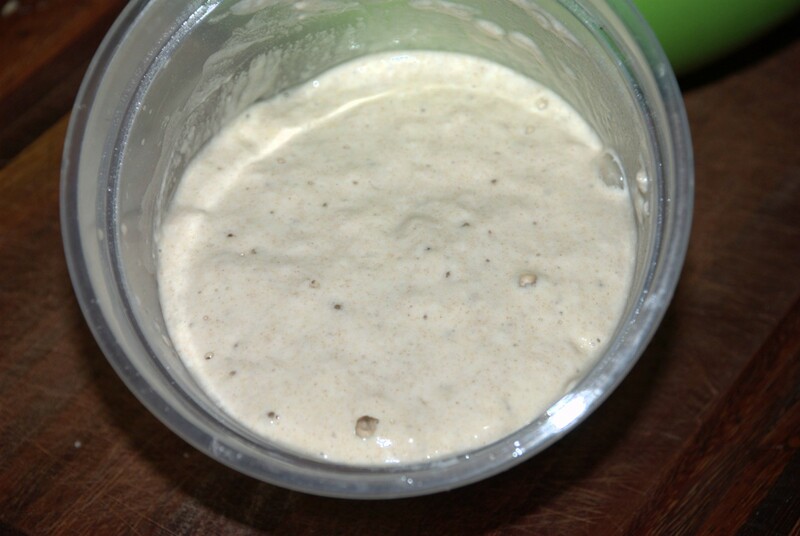 The starter had more than doubled in volume in the space of two hours and it was time to make up the baguette dough. one cup of water. Another cup of water went into the mix, resulting in a very runny dough. So I added another half cup of flour. This made the dough very soft. I mixed this lot by folding rather than kneading. 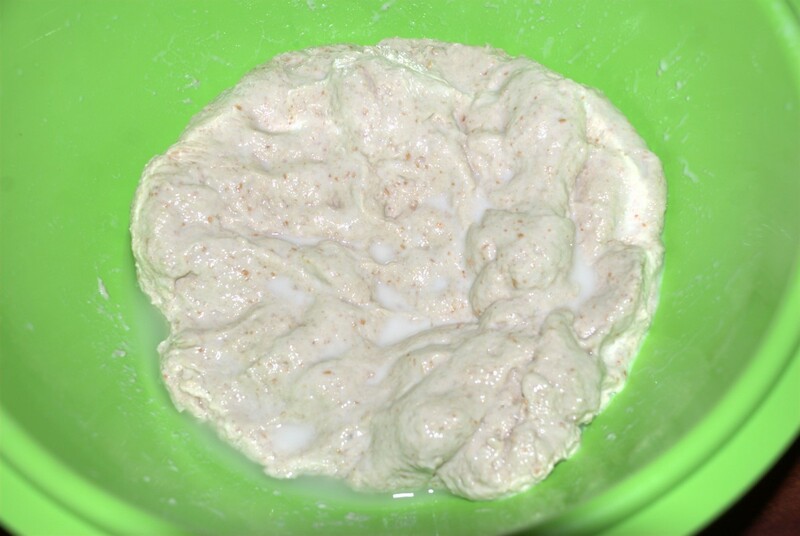 The dough ball was oiled by patting with oiled hands, then left to rise overnight in the closed-off mixing bowl. 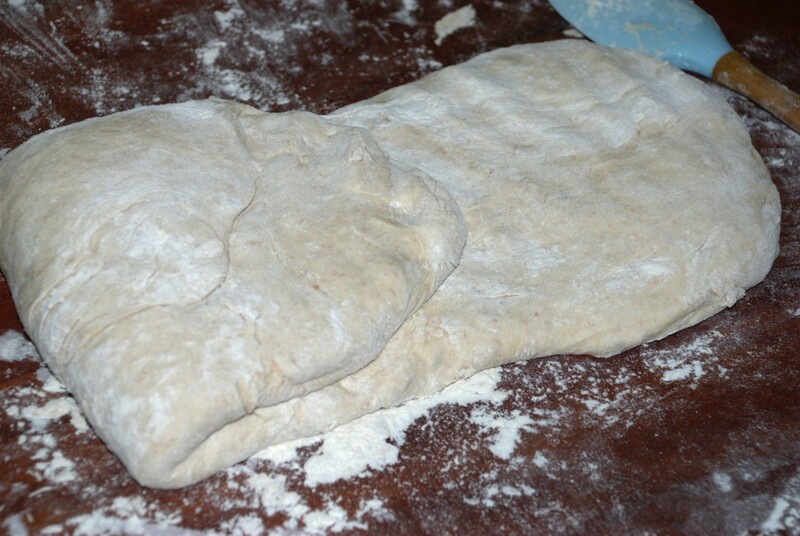 the kneading board. No sweat, I just added another cup of flour to get the consistency right; a nice soft dough that would stand by itself. This was left for another three hours to rise, before cutting and shaping. The dough again more than doubled in volume during this time. This time I got all the diagnostics right, as well as the remedial work! Chalk up one for reading the manual! 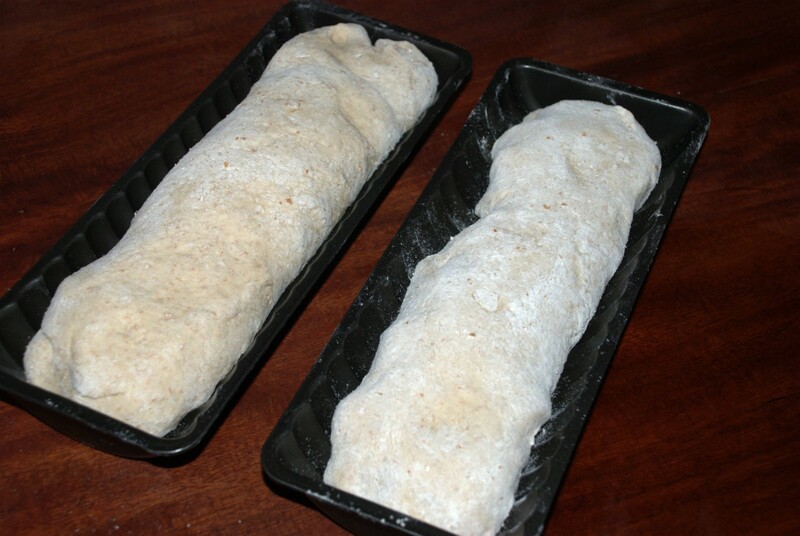 The dough was divided into two blobs, rolled out, lightly floured and rolled back up. 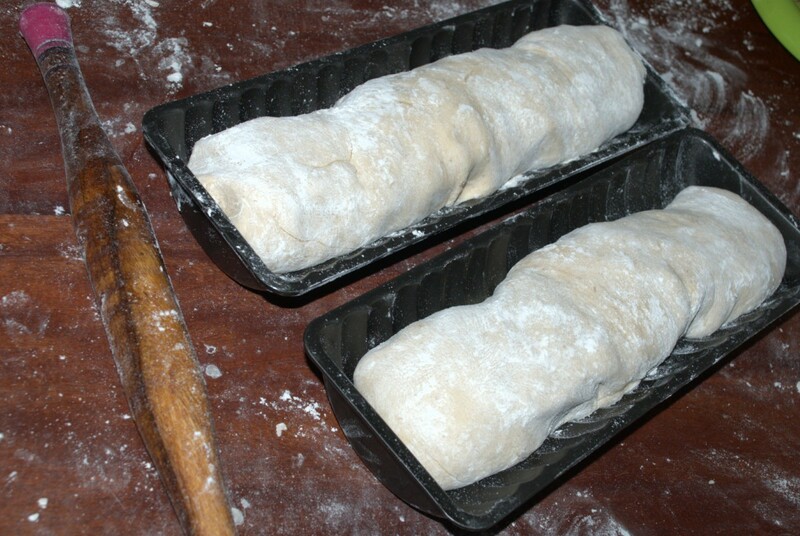 The ends were tucked in nicely and into the baking tins the loaves went. These were left for about two hours to rise properly again, then sliced on top and popped into a pre-heated, steamed oven at 200ºC/400ºF for 40 minutes. The steam compliments of a small stainless cup of water in the bottom of the oven. This time the loaves came out as expected. The crust was a bit thicker than expected, but nice and chewy. 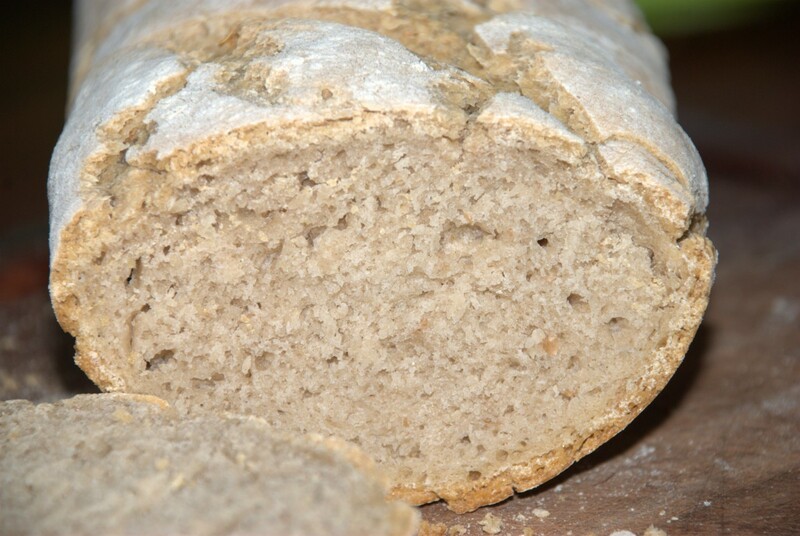 The crumb had mostly even fermentation holes and was as heavy as the first baguettes made with instant yeast. At least I got the consistency right. The taste was a bit less sour than expected, which is good. 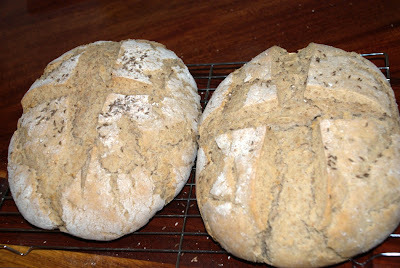 Perhaps due to the absence of rye flour. 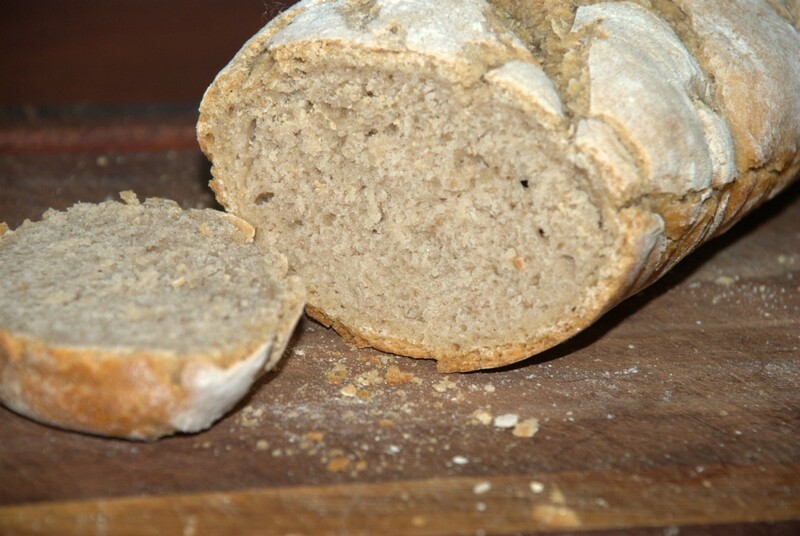 The crumb colour was on the dark white side, but this is good, showing the unbleached effect. I think the coarseness of the flour also plays a role with the denseness of the resulting loaves. Have to do some research, methinks. Now for a sandwich with real butter and mature Cheddar cheese with my morning tea, I think. 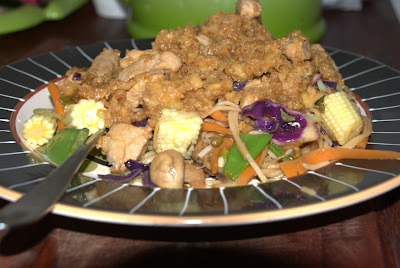 Just the other day I realised that I haven't made this dish for ages. In fact, the last time was about two years ago. My journey into the world of proper food has certainly taken me along a new path! So, after a short discussion with the missus, the decision was made. 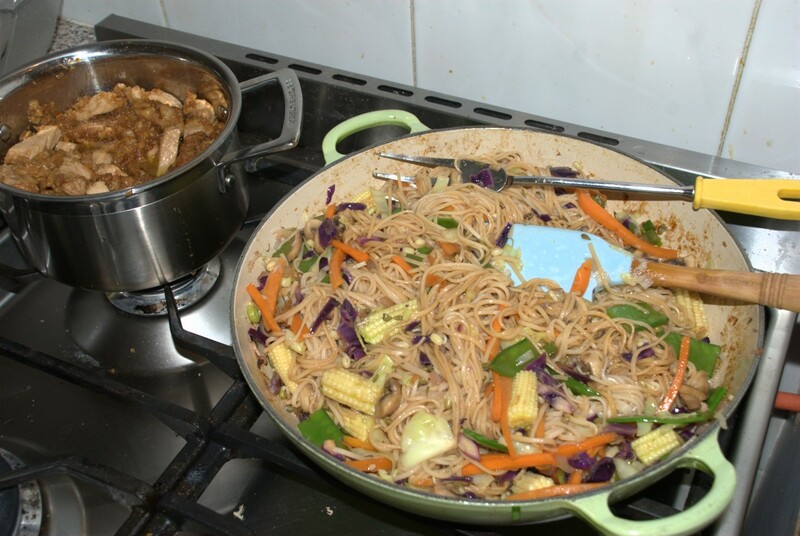 Time for a decent stir-fry dish again. This dish may be cooked on board, buth one needs to look at the sequence and the conditions at sea. The preparation may take some time. However, it is a very good pastime for idle shipmates to help and have a decent conversation to boot! I used to make this one in my braai-skottel out of doors. This skottel has fallen out of use since our relocation to the little town of Strand. This recipe is adapted from a stock standard Chinese recipe for stir-fried pork. It also works very well for chicken and extremely well for turkey. 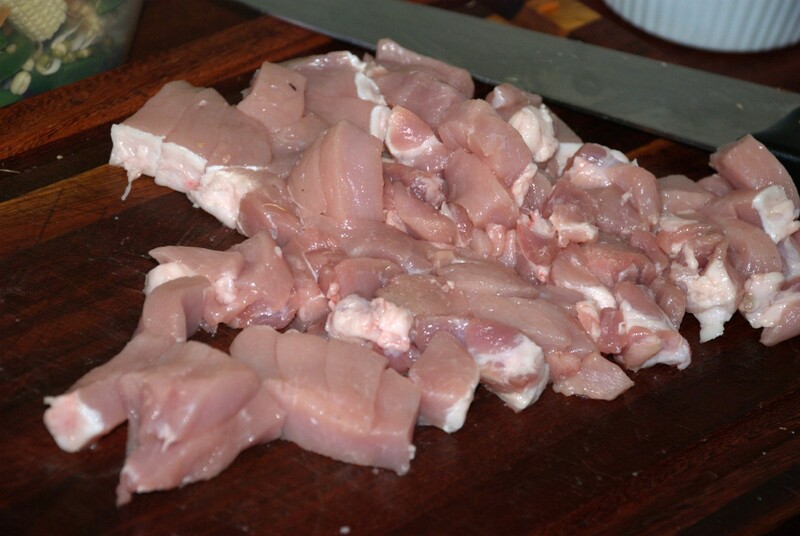 I also cut off all the fat and, in the case of using chicken, I cut off the skin. The turkey which I am unable to locate locally, except for a whole bird, complete with the requisite chemical basting juices injected, ready for the oven. This recipe calls for de-boned, non basted meat. Wholesome, unadulterated meat. There is no special addition of salt in this dish. The soy sauce takes care of all of the salt. I use the light soy sauce because I am told it contains less salt. The preparation of the ingredients takes up more time than to cook the dish. This recipe will render at least four decent helpings. 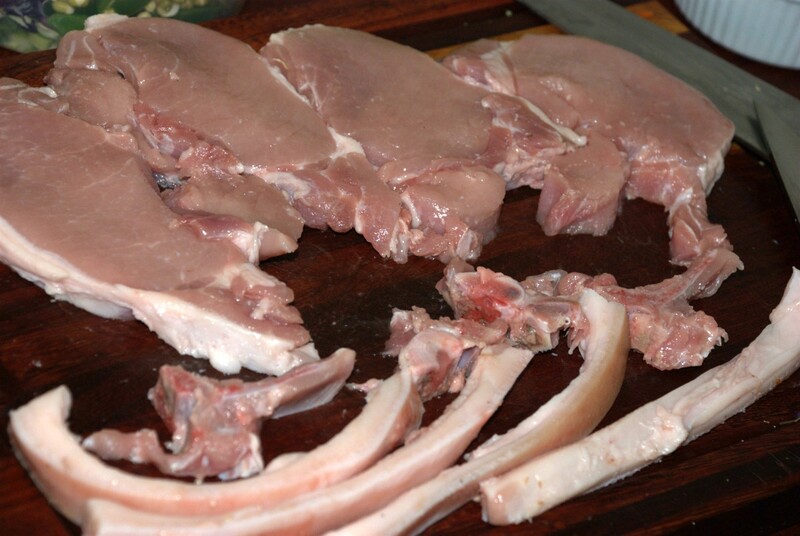 I use the cheapest cuts of pork that I can find, then remove the fat and bones at home. Sometimes you get pork cut up into strips ready for a stir fry at the same price as other cuts. Wonders never cease. 1 kg de-boned pork or chicken. This time I used pork. 1 Thai, Jalapeno or medium heat chilli or ½ a Habanero with the pips removed. Chopped finely. 2 medium carrots, julienne'd. This for the looks! 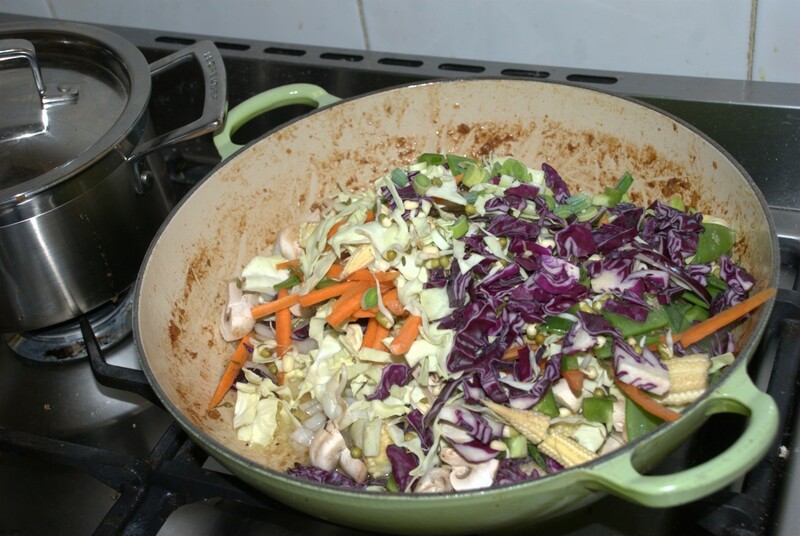 Depending on the number of servings, you may also use some cauliflower, broccoli and baby marrows. You can also add some rehydrated dried mushrooms. They tend to add to the flavour. 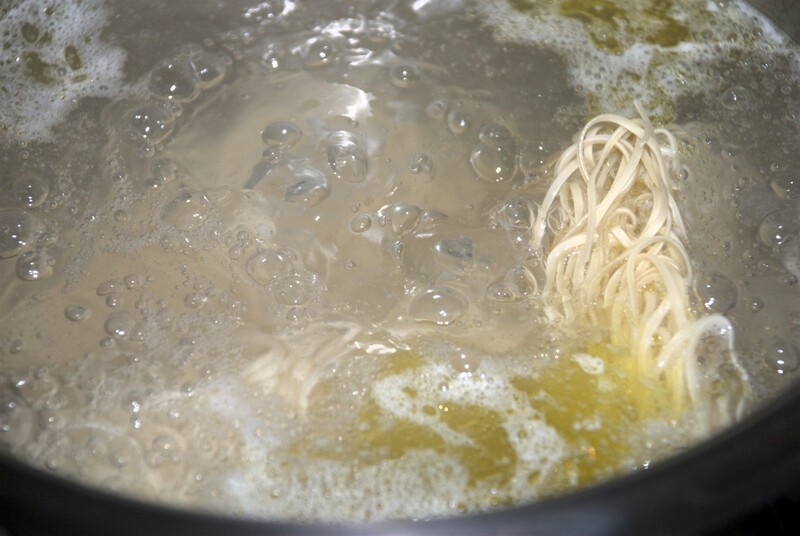 Get the water for the noodles on the boil and boil the noodles. This takes the longest and gets used last, so it starts first. 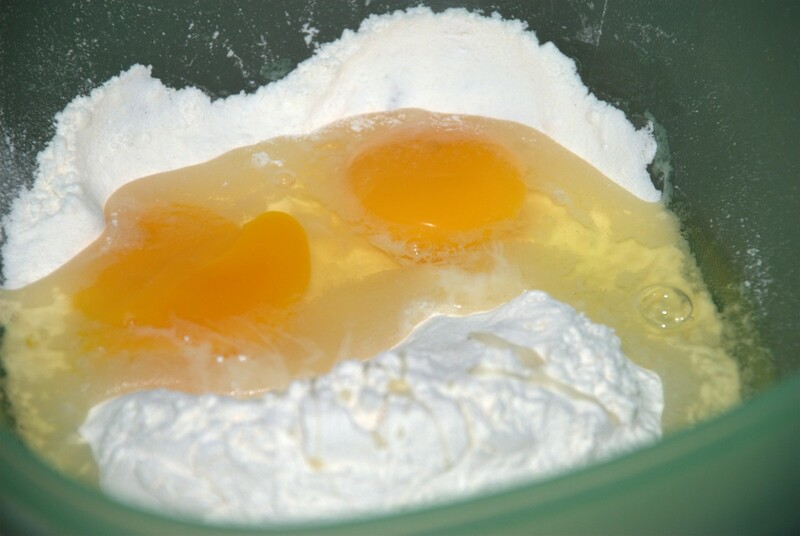 Mix the corn flour and the eggs until you have the consistency of a thick batter. Dump all the pork in there after you have cut it up into small strips. Ensure all the meat is covered in the batter. Heat some oil in the pan. I used my Le Creuset buffet casserole, as I was cooking indoors. Add the meat to a medium to hot pan and fry until the outside of the meat is nice and brown. The cornflour will make this easy. 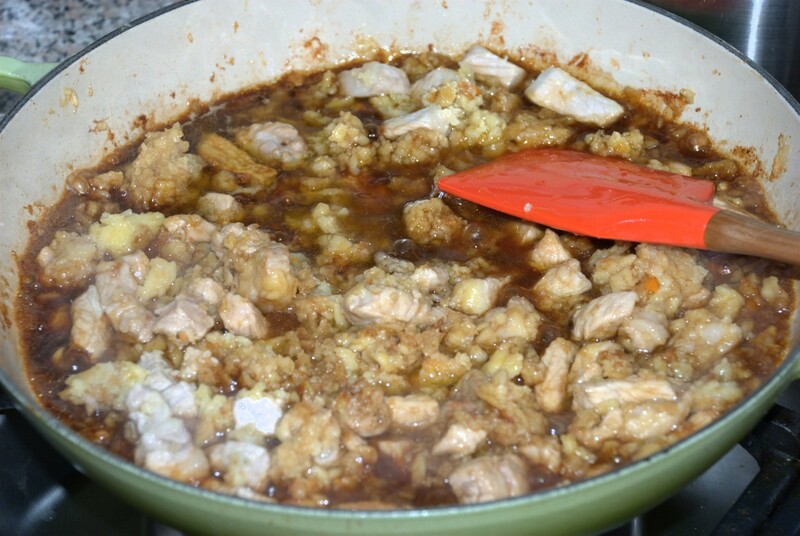 Remove the browned meat from the pan and keep to one side. Add some oil and fry the chopped chilli in the oil for 30 seconds to 1 minute. Add the meat back to the pan and mix thoroughly. 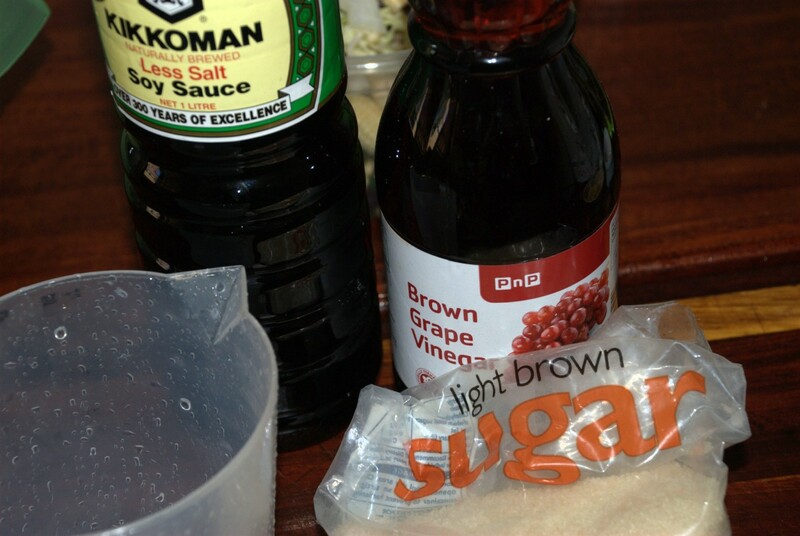 Now add the glazing sauce which is the mix of vinegar, soy sauce and sugar. 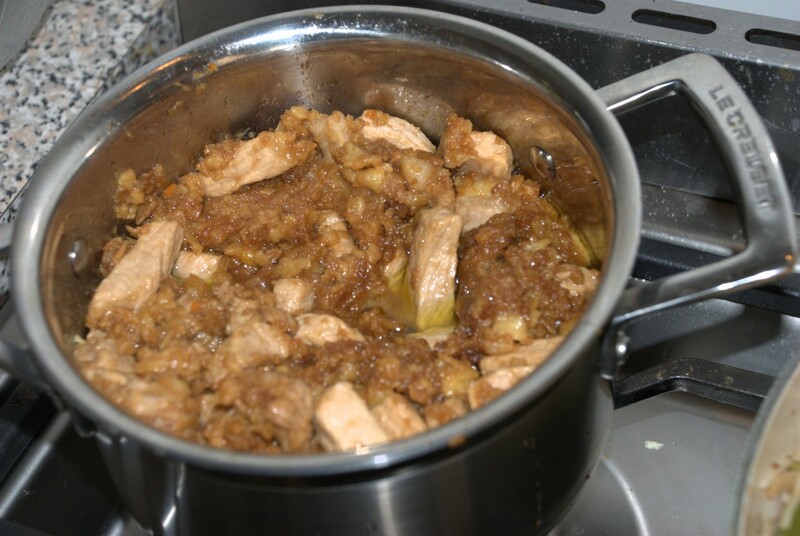 Stir continuously until the sauce has thickened enough for your taste, then remove the meat from the pan and keep it warm. I used another Le Creuset saucepan for this, as it keeps the heat nicely in, although the saucepan is still cold. Add some oil to the pan. 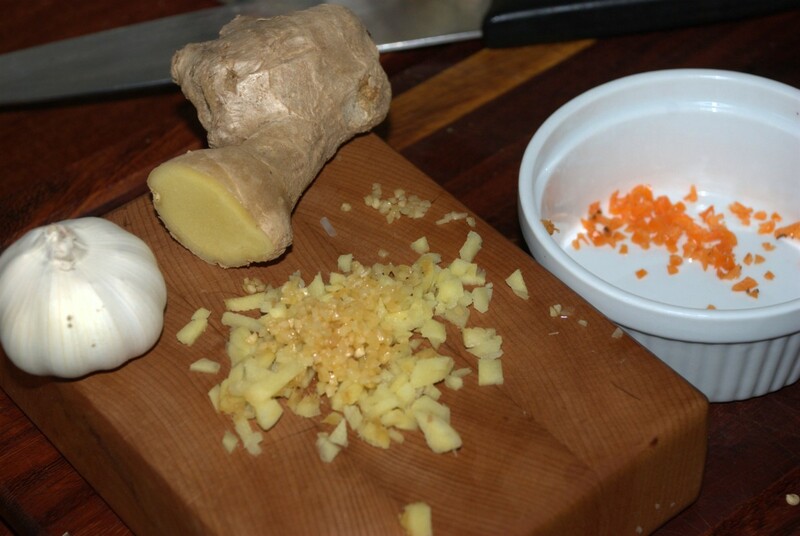 Fry the white pepper, ginger and garlic for 30 seconds to 1 minute. 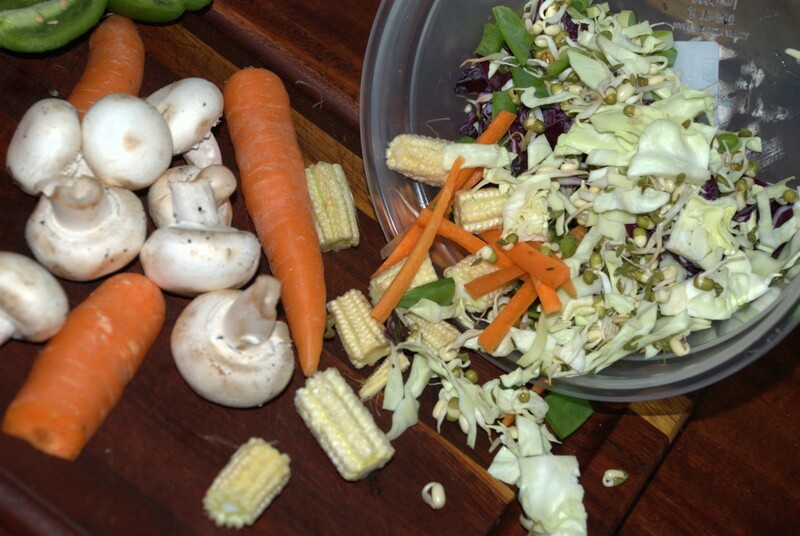 Then add all the vegetables en masse. 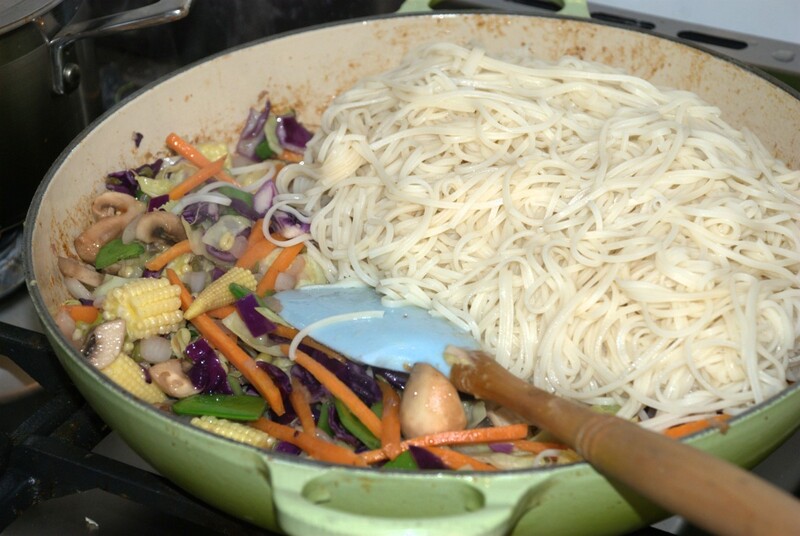 Stir fry this lot until the vegetables are al dente, then add the cooked noodles. Mix this lot thoroughly, then add the quarter to half cup of soy sauce. This will give some flavour and add the requisite salt to the dish. Voila, the deed is done! Heat the meat, if necessary, before dishing up. Yesterday I got a gentle prompt from the missus that we were running out of bread. Time for another loaf. The last one was not half bad, having sunflower and pumpkin seeds along with the rye. Although it did not rise as expected, the bread lasted long enough for me to take a loaf on board the yacht for the voyage from Port Owen on the West Coast to Gordon's Bay around Cape Point. Good food to have on board. I was a bit miffed about my starter after my last baking experiment, until I realised that I may have had the dough too runny and did not allow sufficient rise time. As an aside, it seems that my terminology and practices may be frowned upon by some of our friends in the sourdough world. I recently had the ignominous experience of having my reply reference “washing” of the starter on a blog question removed and replaced by a very scientific explanation from someone else. This after I quoted my reference quite diligently. Interesting indeed, even if I felt taken aback. Anyway, getting back to my present experiment, I made a reasonably soft dough. 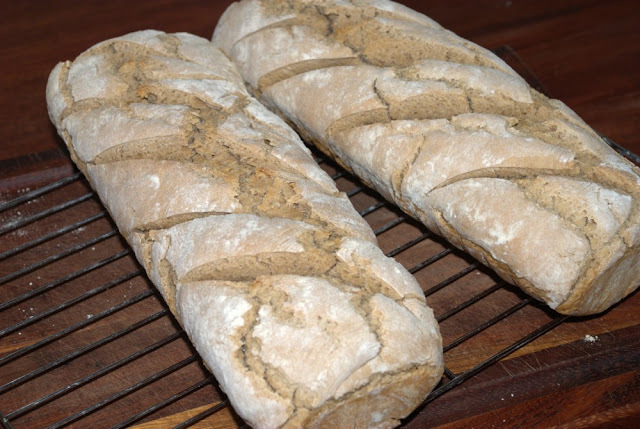 Three cups of white bread flour, one cup of brown bread flour, salt and water. The starter was also made with another cup of white bread flour. This lot was left to rise for two hours, then I added a little more water. The dough was now decidedly soft, but I left it to rise overnight. Patience is a real virtue here! This was very successful with the dough almost tripling in volume. However, the dough was collapsing on itself, so I had to knead in a little flour again, about half a cup. This lot was split into two parts, patted into long, thin loaves and left to rise in bread pans while I went swimming and tended to my other errands. By the time I got back two hours later, the dough was dripping out of the bread pans. The decision went to adding yet some more flour, about half a cup again, then splitting the dough into two halves for making a pair of round artisan style loaves. I added some caraway seeds for garnish and baked them for 45 minutes at 190ºC/375ºF on my paving bricks. There was also my normal (by now) tin of boiling water in the bottom of the oven. This time around the bread came out magnificent, no over-baking, solid crust and a nice spongy crumb. I was rather hoping for some nice big fermentation holes in the crumb, but it seems that I missed the boat this time around. Some more attention to quantities next time, methinks. The loaves were left for an hour to cool down. Now for the discipline of not consuming all of this before dinner!